I swear the black camo Sun Salutation pants were uploaded to the US side of the website Monday night but they either sold out or I imagined it. 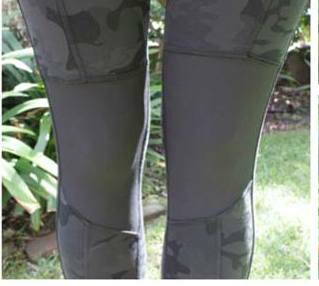 These photos are from Australia so if the pants aren't here yet, they will be. Pretty Pigment Blue shirt teased in the photo of the Black Sun Salutation Pants on the website. It turns out I am not the only one who didn't get the size Tracker II shorts she wanted. There are more than a few people complaining on the SW Facebook page about the same thing. 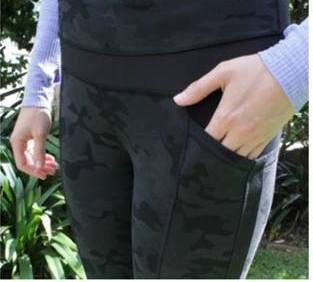 I am reading that size ten Tracker II shorts are also sold out now (update - size 8 Tracker IIs are gone now, too) and may have sold out fairly early today (apparently the 12s were gone in 15 minutes and the 10s shortly after). I guess I was lucky to get mine when I did. The de-coupling of the short-ordering process from race registration makes sense now. Lululemon pre-ordered the registration shorts from their factory months ago and they obviously underestimated the demand for the larger sizes. I assume they threw a lululemon customer curve (average size is six) on the order instead of a more average person curve though you would think they'd have sale data from last year's expo to help them figure out size demands. 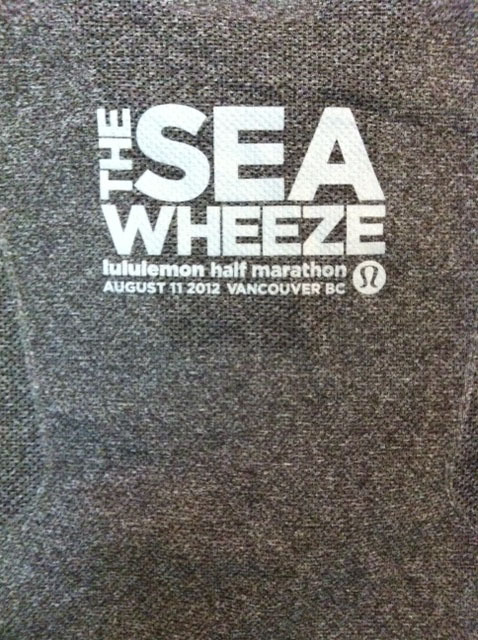 In addition, I know there were a number of runners who ran the Sea Wheeze who couldn't fit into size twelve shorts even if they were able to order them. It seems a shame that they are discriminated against this way. I suggest one way to solve these problems would be to change the registration perk from a pair of run shorts to a screen printed Swiftly. I would think screen printed Swiftlys could be made to order and heavier runners could wander into the men's shirt sizing if they needed to. I've said it before but I would really prefer a race shirt to shorts. The shorts are a different and neat idea (it's like you are members of a secret club when you run across another person wearing them since you have to be 'in the know' to understand what that particular color/logo means) but maybe it's an idea that should be retired now. 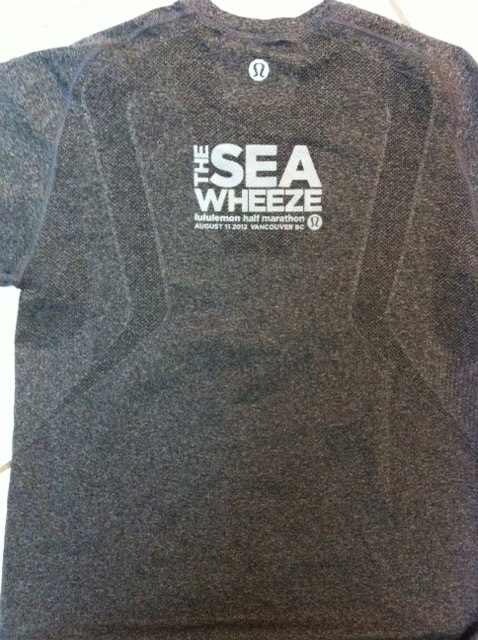 This is the shirt that employees got to wear for the first Sea Wheeze and which my husband was lucky enough to snag on eBay a few months after the race. Even if this doesn't become the race perk, I'd love to be able to buy a shirt like this at the expo. I'd also suggest also making future race perks, whether shorts or a shirt, pick up at race only. I have a feeling that quite a few of race registrations were from people who had no intention to run and only wanted to flip their shorts on eBay for profit. Update - Just got a tweet from a reader. The size eight Tracker IIs are gone now, too. I'm really surprised the demand for Trackers was so underestimated. I saw so many people wearing the longer Track Attacks on the course last year - they were very, very popular and were very popular in the Sea Wheeze re-sale market on eBay. I'm also kind of shocked that Speeds were offered in a size twelve. I didn't even know they came in that size. Not that I would have ordered them. I definitely like the longer coverage of the Tracker IIs/Track Attacks/Groovy Runs. My size four sister and size six fifteen year old niece also prefers the longer Tracker II short. Upon further thought, I guess lululemon could keep the short as the registration perk but if you got them at packet pickup instead of in June then they'd have time to make them to order instead of guesstimating the sizes they need. Anyway, I was a bit bitter this morning I couldn't get my first choice in sizing but it just spurred me on to lose my winter fluff that much earlier (hello Jillian Michaels Diet Bet). I'm glad I was able to get the next size down, though. I'd be super bummed to have to order a size six in the Tracker and I wouldn't even bother with Speed shorts. 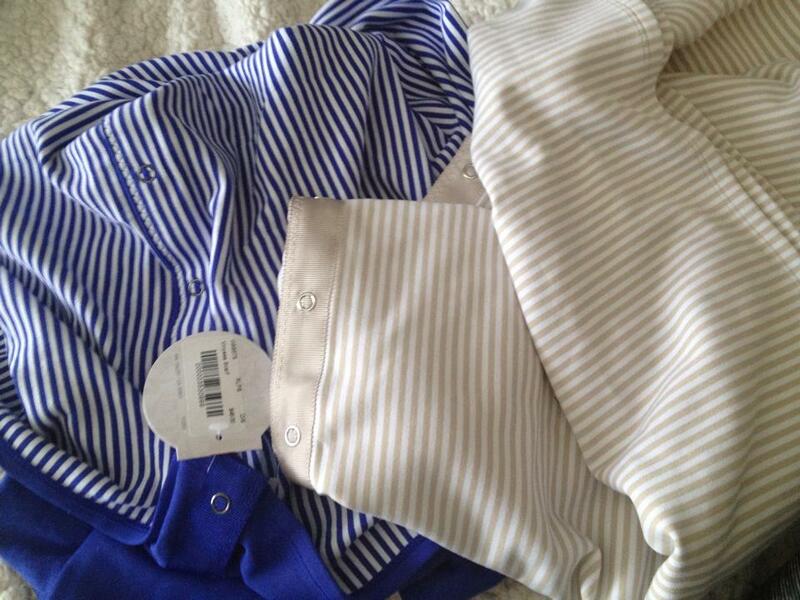 Thanks to Ms. N. for the photo of the latest Vinyasas in Pigment and Cashew. I hope this means that we'll be seeing more Cashew tops are coming. I would love a solid Cashew CRB. Ugh! I go to order my Sea Wheeze shorts this morning at 11:15 am - 75 minutes after the TWO WEEK window opens - and the size 12 Tracker II shorts are already gone. Thanks a lot, lululemon. Next time make it so you can order the shorts with the race. So not happy with this. I'd like to know why, in a pre-order situation, that I cannot get the size I desire in my race shorts. In no other race has this happened to me. They would have had two extra months to make shorts if the initial race registration process had been done correctly. I cannot help but think this will be a preview of how the expo will be this year - that there will be very limited offerings for size twelves. 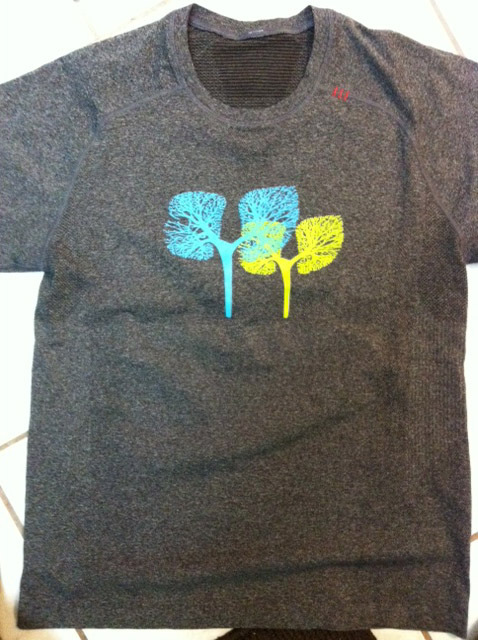 It seems like lululemon is starting to diss the size twelve again given the fact that quite a few new crop colors (e.g. Camo Wunder Unders), jackets (Lightened Up Pullover to name one), and tanks are not coming in the size. My stores have stopped getting size twelve Groovy Run and Tracker II shorts in and I have to order that size on line now.